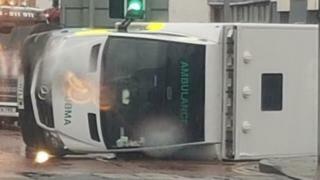 An ambulance has overturned after a two-vehicle collision in West Lothian. Emergency services were called to the scene in Whitburn just after 06:40 but no-one was injured. The ambulance rolled over after it was involved in a collision with a a Ford Ranger on East Main Street at Whitburn Cross. The vehicle was not transporting a patient at the time. The fire service also went to the scene and helped police make the road safe. The ambulance was responding to a 999 call to a patient in a non life-threatening case. A Scottish Ambulance Service said: "Responding to a call out, an ambulance was involved in a collision with another vehicle at Whitburn Cross at 06:43. "There were no injuries to the ambulance crew or the driver of the other vehicle. "Another ambulance was quickly dispatched to deal with the original call in Bathgate."